Baby Please Come Home is a dusky purple metallic textured polish. The metallic finish looks really cool when it dries down with the texture - I'm definitely a big fan. I love the deeper tones of this shade. It's very glamorous! Two coats. Emotions is a black textured polish. It also has some medium black glitter, which caught the light at certain angles! Some of you may be concerned that this one is similar to the "beaded" effect polishes from other brands, but I can report that it wasn't chunky or odd-looking on the nail at all. It looked like carbon to me! Three coats. It's Frosty Outside is a tinseltastic silver metallic textured polish. This is the first one that I wore in the collection; I couldn't get it out of my mind! It's SO holiday appropriate and the medium silver glitters provided just the right amount of visual interest. Two coats. Kiss Me At Midnight is a cornflower blue textured polish with silvery white glitters. In addition to the medium glitters, this one also has some larger pieces scattered through (you can see a few on my middle fingernail). It looks really cool dried down, and I was pleased to see this pop of color in the Sands. Two coats. Make Him Mine is a rose metallic textured shade. I'm actually wearing this one now as I write this post, and have had it on for three days now (PS - no chips to report). It makes me think of wrapping up in a soft blanket and sitting by a fireside, though I'm not sure why! It can look a little paler depending on the lighting. Two coats. Silent Stars Go By is a champagne metallic textured shade with just a touch of pink. 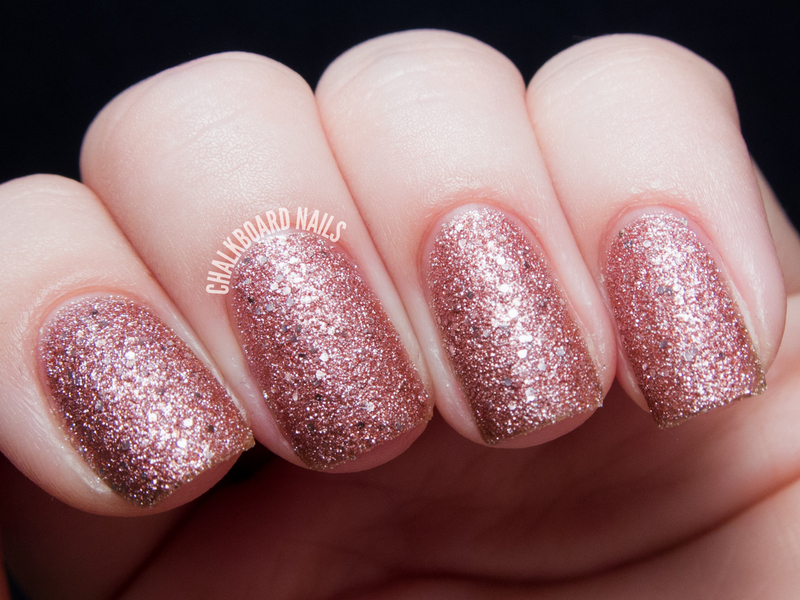 Imagine yourself at a holiday party, holding a glass of bubbly, with this on your nails... It's perfection, no? Two coats. These shades took me by surprise. While they aren't the traditional red, green, and gold of Christmas, they are definitely holiday appropriate without being in your face. 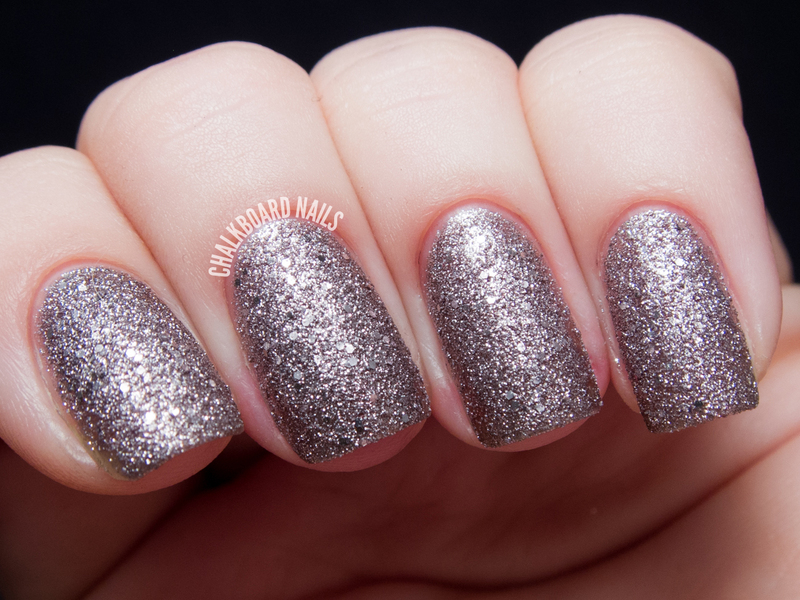 The metallic shades bring just the right bit of glitz and glam, and the long wear time means you can rock them during your busy holiday season without needing to constantly change your manicure. Mariah Carey Holiday is available now at Professional Salons, including Beauty Brands, Beauty First, Chatters, Dillard’s, jcp Salons, Pure Beauty, Regis, Trade Secret, & ULTA. You can also shop this collection online via ulta.com. 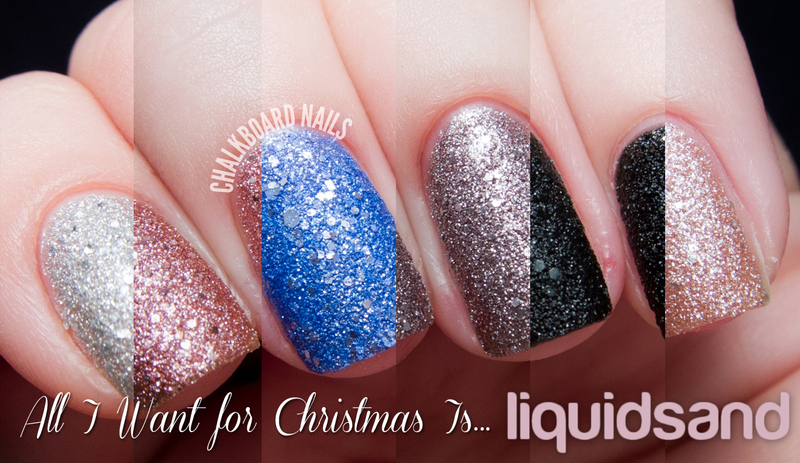 Each lacquer retails for for $9.00 ($10.95 CAN). Kiss me at midnight is my favorite! Would you mind sharing how you made that top picture btw? It looks amazing and I can't figure out how you did that, haha! DAT BLACK TEXTURE ♥ so good. Just so SO pretty! I love all of these polishes!! I generally love the look of sands, but removing anything textured/glittery is next to impossible. Any tips or tricks to make it easier? I have It's Frosty Outside and Kiss Me At Midnight and though I haven't worn them, they are really beautiful shades. I've actually found the Liquid Sands to remove a whole lot easier than glittery polishes. I was really surprised the first time I used one. I use acetone nail polish remover, so maybe that's why. I was totally blown away the first time I wore Make Him Mine - I remember waving my hand around in the sunlight and feeling like I had pink diamonds on my fingertips. Thanks for showing how pretty the rest are - guess it's time to go shopping! These are all so amazing! Especially Baby Please Come Home and Emotions! I was also surprised to find that Liquid Sands remove easier than glitter. Like Melissa suggested, I would use pure acetone and some premium cotton rounds. If you are still having trouble, try googling "glitter removal foil method" -- there are some great tutorials for that particular method! omg, baby, please come home and emotions!!!! i'm drooling. emotions is amazing--makes me think of a fabulous sequined black evening bag i had when i was younger. Oh man, I just want all these shades. It's Frosty Outside and Silent Stars Go By look particularly lovely, like shades I could wear a lot. Oh, I wish I could OPI where I live! I love that black. It's the first I've seen that doesn't contain silver glitter. NEED! I love them all! Can't decide which shade looks the best, they are all amazing! I'm usually not a fan of texture polish but It's Frosty Outside might just be an exception! Same with Make Him Mine. So pretty! I need Emotions and Its Frosty Outside. NEED. :D great swatches! Oh wow. Gorgeous swatches. Baby Please Come Home and Silent Stars Go By WILL be mine! These are all so gorgeous but Emotions is amaaazing, I need it! I have this collection sitting in my shopping cart, debating on buying it and now I basically have to. So beautiful!